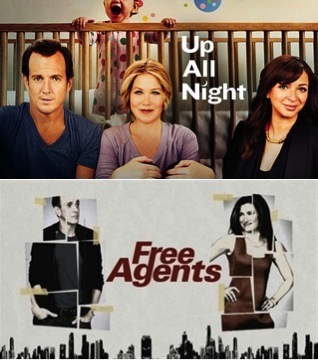 Based on the reactions I had read online before the two shows premiered, and my knowledge of who was involved with each, I was expecting to like Up All Night and really dislike Free Agents. Now having seen them, I can say my expectations were met in one case, and happily exceeded in the other. Up All Night was fun and charming and has a lot of potential. I really liked the scenes between Christina Applegate and Will Arnett (who isn’t trying to do yet another variation on the GOB Bluth man-child) as two new and unprepared parents. They have a nice chemistry, and the baby storylines are rich for comedy. Comedy, though, is where the series is lacking for now. The Maya Rudolph talkshow portion seems like an entirely different show, and the broadness isn’t even that funny. I really only laughed a few times during the whole half hour, and it was all at the at-home/baby stuff. Still, I enjoyed it and I’m excited to see where they go with this, since it’s a strong premise and has some wonderful comedic performers (although Nick Cannon is not one of them). Free Agents also has a lot of talent involved, but based on early reviews, I did not go into it with high expectations. So maybe it was that it just surpassed a low bar, or maybe I just have a soft spot for Hank Azaria, but I found myself amused and engaged throughout the pilot. Azaria’s Alex and Kathryn Hahn’s Helen are both corporate PR executives. He is coping with a recent divorce, she is still dealing with her fiancé’s unexpected death, and, naturally, they wind up sleeping together. A lot of the office comedy was unbelievably sexist (the entire room begs Alex to recount the explicit details of last night’s tryst at the start of a staff meeting) and the supporting characters are not much of characters at this point, but Azaria and Hahn are funny and play off each other well, and, more importantly, they made me laugh. In a weird, probably nonsensical, way, I think I *liked* Up All Night more, but *enjoyed* Free Agents more. Up All Night has a sweetness to it that makes up for its not being especially hilarious, while Free Agents is darker and more cynical, but also funnier in the moment. I was always planning to stick with Up All Night for at least a handful of episodes, but now (though I probably don’t have the time to add another new show to my schedule) Free Agents will be joining it in the “looking forward to seeing more” category. Comedies are especially difficult to judge based on the pilots, so I hope those involved can quickly figure out what’s working and what isn’t and shape both of these into solid entries on the NBC line-up. This entry was posted in Free Agents, Up All Night and tagged Christina Applegate, Free Agents, Hank Azaria, Kathryn Hahn, Maya Rudolph, NBC, Up All Night, Will Arnett. Bookmark the permalink.